It's been around inconcept-formfor a while now, but Tesla's Model X SUV is finally shipping to customers. Following the Roadster and Model S, the Model X, Tesla's first SUV, is finally available to the public. Despite being more practical than the previous two cars, it's still by no means a sensible car. Capable of reaching 62 mph in 3.2 seconds (in Ludicrous Mode, naturally) and going on to hit 155 mph. In the face of those impressive figures it is still capable of carrying seven people, and has a range of 250 miles, and includes some seriouly impressive tech. The large infotainment screen is back, but this car includes an advanced air filtration system, which filters outside air to fill the cabin with "medical-grade" air. Very useful if things turneven more sour with Russia. The Model X couldn't exactly be called a pretty car, but its design is very impressive. It features a large glass windscreen, made from transition glass, which stretches over of the frontseats (the largest piece of glass used in a car), and equally impressive falcon wing doors, which are hinged at the top to allow easy access to the five rear seats. Worried about multistory carparks? The doors are fitted with sensors which adjust how far the doors open depending on how much space you have. The SUV is also incredibly safe, with a forward-facing camera, radar, and 360-degree sonar. This array will allow autonomous driving, a feature which Musk has promised will arrive via an over-the-air update in the future. Want one? You'll have to be patient. 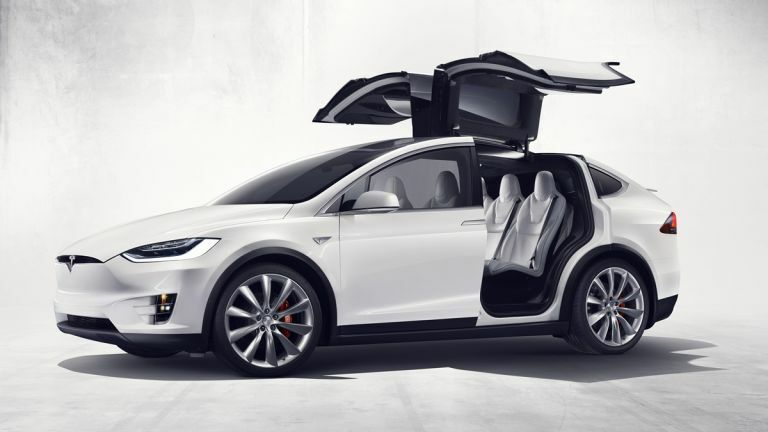 25,000 people have pre-ordered the Model X, and models will begin shipping next year. You can pay £4,000 to reserve one right now, a fully-specced vehicle will set you back $132,000 (around £95,000).